This is Goodly Creature's right hand... er, appendage. I'm honestly not sure how the trumpet got in there. 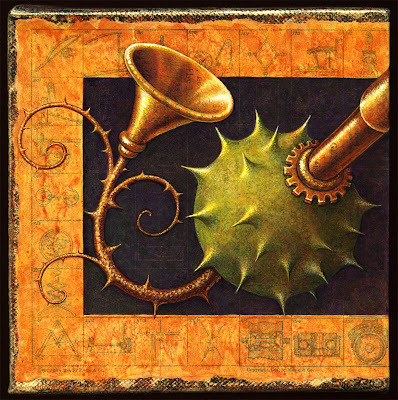 I didn't consciously think "trumpet vine" until I was titling the image file, but my head often generates visual/verbal puns without asking me first. The text for this one, a page from Genetics & Eugenics, was almost totally obliterated by paint, which sometimes happens in the pursuit of more dramatic lighting effects. One of the disadvantages of paint over Photoshop... you can't play with lighting & contrast forever & still hang onto transparency. If I were doing it over I'd have planned the lighting a bit better so as to preserve the text. Oh well. Please click the image for details. To see all the posts in this process, please click the "Goodly Creature" label below. You can also see Goodly in his final assembled state on my main blog, Curious Art.